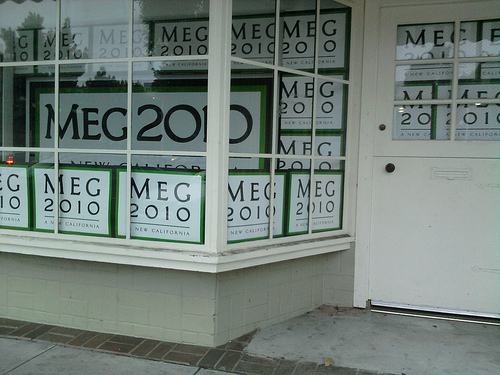 Life-long leftist grass roots organizer and business woman considering bid in upcoming election. In order to evaluate a logistical and thematic approach we are soliciting applicants for the positions of Treasurer, Publicist, and Community Liaison. Please review position descriptions below and submit your qualifications by email. In person meetings will be scheduled to for further discussion. Treasurer: Will manage incoming contributions and campaign expenses as well as insuring compliance with regulations governing the reporting of both. Experience with campaign finance preferred. Office Manager/Publicist: Will handle phone calls, correspondence, and headquarter establishment. Will also manage website and social networking presence. Competency in Twitter and Facebook a must. A high-quality camera is a plus. Excellent opportunity for a student of PR. Community Liaison: Advisor to candidate on trending issues and position formulation. Will reach out to local groups for support, standing relationships with community organizations will be of the up most importance. Duties will include scheduling meetings, and coordinating a supporter’s network. All positions will be on a part-time volunteer basis with future compensation dependent on fundraising success. If you are dissatisfied with the current candidates for office and would like to take a stand and make a difference for a better Oakland please send an email with information about yourself and your vision. Being Mayor of Oakland is a thankless job, and it won’t be getting any easier as the city careers toward a fiscal cliff, but apparently a lot of people want the gig: there are already more than half a dozen names in the hat, or hats in the ring, or whatever your preferred hat metaphor is. And no, I’m not signing up for this incipient campaign—at least not until the mystery candidate emerges from the shadows. In yesterday’s post about the community meeting with Oakland’s new police chief, I focused almost entirely on his presence and leadership qualitiies, and I mostly ignored the specifics of his plan. That was partly intentional: I am not an expert on policing strategies, nor do I wish to become one. The whole point of having an effective police chief, in my view, is so that non-professionals don’t need to concern themselves with policing strategies. Given Chief Batts’s success reducing crime in Long Beach, his evident intelligence and competence, and what appear to be good leadership and management skills, I have high hopes that the department is in good hands, and that if we let him do his job, we will see some measurable results in coming months and years without having to second-guess every decision he makes. With that said, I did hope to discuss the specifics of his plan a bit more, but I simply ran out of time last night (also, the post was getting longer than I expected). As I wrote last night, most of the meeting was dedicated to a presentation of two documents: the “Strategic Plan Framework,” and a slide show which enumerates the ways in which the Police Department fails to live up to the goals presented in the Strategic Plan, and then repeats the information in the Strategic Plan about how Batts hopes to meet those goals. Both documents are very quick, very easy reads, so I recommend them to anyone in Oakland who wants a clear and simple presentation of what Batts’s priorities are. I won’t summarize the presentation here, because it is already written in bullet point format in the documents, but Batts (along with Assistant Chief Howard Jordan and Scott Bryant, a strategic consultant who is advising Batts as he reworks the department) did elaborate on several of the topics, so I’ll relay some of that information here in case it is not widely known. The other thing that pervaded every aspect of the meeting was the staffing problem. Almost everything Batts said was placed in the context of explaining how he hoped to accomplish more with inadequate resources. For instance, he explained that he has ordered detectives to work patrol twice a month in order to help reduce 911 response times and provide more police presence in neighborhoods. This helps on the streets, but obviously it means that fewer manhours will be devoted to detective work. And with more officers on the street, more cases will be kicked up to the detectives, so the detectives’ workload could increase as they simultaneously have fewer hours to devote to investigating crimes. He is gambling—that’s his word, not mine—that the beefed up police presence on the streets will eventually pay off in lower numbers of crimes that need to be investigated, but it is a gamble, and clearly he would prefer to have more patrol officers and a full detective corps. He simply doesn’t have enough bodies, so he has to find new ways to make do with what he has. This is an average, so in many cases, it takes far longer than 15 minutes for a cop to show up when someone calls 911 and reports a crime—Batts alluded to horror stories about people who have reported burglaries in the early afternoon, and then been woken up at 4 am by an officer who was finally showing up to take a report. (“Unacceptable” was a word that Batts and Bryant used several times during the presentation.) You can see in the graph that the bulk of the delay is caused because processing the call takes longer, and dispatching a unit takes longer. These are directly caused by a shortage of dispatchers and a shortage of officers on the streets. Batts said that a city like Oakland should have about 12 dispatchers on duty during peak hours (2 pm to midnight, roughly). Oakland usually has 6 dispatchers working during peak hours. He did note that 11 new dispatchers are about to be trained, which will nearly double the total amount (there are currently 15). This should help improve response times somewhat. The more serious problem is the shortage of officers. The green area in the graph shows delay that is almost entirely caused by a lack of available units—dispatchers are ready to dispatch, but there are no officers ready to be dispatched. Unfortunately, this is extremely hard to address without a major increase in the number of sworn officers, and there are few prospects for any significant improvement in this area anytime soon—Oakland is already about 25 officers below the minimum number of sworn officers mandated by law (803) and Batts said the department loses an average of 4 to 5 officers a month due to attrition. I believe he said that there are two lateral academies scheduled for later in the year (lateral academies are short police academies for officers coming from other jurisdictions), and that he expects a full academy to occur in 2011 (I could have some of this wrong, because I didn’t take notes about everything). Those academies might help keep Oakland near 803 sworn officers, but Batts himself has said that 800 officers is far too small for a city of Oakland’s size and Oakland’s crime rate. Batts also pointed out that because there is an endless backlog of 911 calls, it means that police officers in Oakland are almost never able to do any real patrolling—or what he called “hunting for crime” by driving up dark alleys, checking in on parolees, and so on. Ideally, he believes that 30% of an officer’s time should be spent on that sort of stuff; in Oakland at the moment, the percentage of time spent on that sort of stuff is essentially zero. Chief Batts is working on ways to have civilian employees take over some of the desk duties that sworn officers now do, so that he can get more officers out on the streets, but it’s hard to imagine that you can free up a significant number of officers that way. Batts, despite his general candor, was extremely careful last night not to wade into the perennial debate about how to pay for more officers. In the context of answering a question about CompStat, he pointed out that while he is friendly with Bill Bratton and believes strongly in using time-sensitive data analysis as a tool, Oakland is not New York, and indeed, the West Coast is not the East Coast. He noted that eastern cities typically have much larger police forces per capita, but officers are less well paid. He pointed out that New York has about 40,000 police officers and joked, “That’s an army! I could take over the world if I had 40,000 officers!” Despite those observations and the frequent references to limited resources, Batts strenuously avoided expressing any judgments about funding decisions, or the high salaries and generous benefits and pensions that OPD officers receive. To his credit, Batts never made any effort to use the understaffing of the OPD as an excuse for not being able to accomplish his “vision” of turning Oakland into one of the safest large cities in California by 2015. Instead of whining about how he can’t get anything done with only 800 cops, he talks about the staffing problems as if they are simply a fact of life that he needs to work with. That unwillingness to pass the buck or make excuses is one quality that people seem to find so refreshing. I’m getting depressed just writing about this stuff, so I should probably move on to the more positive aspects of the meeting. Assistant Chief Jordan reminded people that crime was down 37 percent in January compared to January 2009, and crime is down 31 percent for the year to date. Oakland had 7 homicides through the end of February, compared to 9 in 2009 and many more in 2008. Chief Batts said at one point that the D.A. is bringing more cases, so I assume that means that even as the number of crimes committed has been declining, the number of crimes solved has been rising. I don’t want to read too much into two months of statistics, but I’d certainly rather have the numbers trending lower instead of higher. Chief Batts has some other priorities which I won’t go into here, since I don’t have anything to add beyond what is in the presentation. He is very interested, for example, in strengthening ties with neighboring cities in order to address some of the regional problems that cause Oakland’s violent crime—the movement of drugs and guns being two major examples. He wants to move to a “Total Community Policing” model, basically meaning that instead of having certain officers assigned to work closely with communities while most officers chase 911 calls, he wants to move toward having all OPD officers work more closely with the communities in their beats. Chief Batts also seems to believe that a major cultural change has to occur both within the OPD, and out in the community, although I’m not sure he would use that phrase. Morale is incredibly low among OPD staff, according to survey results that appear in the slide show, and the citizenry’s confidence in the OPD is also quite low. Batts is determined to change both of those things, and that is where I think that his leadership qualities may play an important role—deploying resources wisely is one thing, but inspiring confidence among one’s staff and the general public are something else entirely. If Batts fails on either front, then the other one alone might not be enough to really change anything. If he succeeds on both fronts, however, then his goal of making Oakland one of the safest cities in California by 2015 might not be quite as far-fetched as it seems. Overall, I suspect that most civilians left the meeting feeling more optimistic than they did when they entered. I know that I did—the bad news was mostly old news, and the more recent developments (about the continued drop in crime this year, and the specific strategies that Batts is employing) sound like good places to start. Chief Batts strikes me as a strong leader, but not the kind of strong leader who is so deeply insecure that he cannot delegate properly or share credit where it is due or defer to those who may have more expertise or better ideas about a particular subject. (Did I mention Rudy Giuliani in last night’s post? Ah yes, I did.) And he seems very serious about his goal of dramatically improving the relationship between the department and the community—last night’s meeting was just one example of his efforts to foster collaboration and cooperation instead of division. I would normally be too lazy to write all this up in a long (and somewhat unstructured) blog post, but I figure the least I can do to repay Batts’s efforts to reach out to the public is to help him spread the word. Remember, there are still two more meetings next week, one in West Oakland on Wednesday and in San Antonio on Thursday, and the Chief of Police wants to hear your thoughts and concerns—how often does that happen? In late January, I rode my bike three miles in the rain (uphill!) in order to hear Oakland’s new police chief at a community meeting. Unfortunately, the meeting had been cancelled the day before with little public notice, so I ended up riding back home. Given that history, I was a bit reluctant this evening to ride three miles in the rain (uphill again!) in order to hear Oakland’s new police chief at a community meeting. Fortunately, the meeting was not cancelled this time, and even more fortunately, the new chief, Anthony Batts, was as impressive as people have been saying. “Impressive.” The word seems to pop up whenever anyone talks about Chief Batts, and before I attended tonight’s meeting, I was determined to avoid that word if I wrote anything about it. I had seen snippets of him speaking at press conferences, and I had read about his success in reducing crime in Long Beach, and I had seen his admirably candid assessment of Oakland’s crime problem in his “strategic plan framework,” but I’m a skeptic by nature, and I also saw some things that made me nervous: in several different interviews or appearances, I had heard Chief Batts say that Oakland’s residents are the police department’s customers, and the department’s mission should be to provide excellent service to its customers. That sounded, to me, like the sort of pabulum that one might pick up at management seminars, and I was slightly worried that tonight’s meeting would be full of meaningless jargon about “partnering with our customers” in order to “advance a shared vision of Oakland” and blah blah blah. 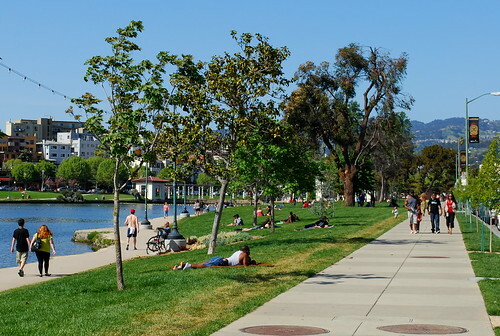 Oakland is not a safe community — in fact it is among the least safe and most violent in the US. Services provided to the Community by the Police Department are nowhere near the standards that should be expected. Many good people in the Community do not trust the Police Department and live in fear of the police as well as of criminals. Collaboration between the Police Department and the Community has not met Community expectations. As I have said on many occasions, the Oakland Police Department’s management and service delivery systems are broken. The Department is clearly under‐resourced given the level of crime in Oakland and the demand for police services. Basic equipment needed for Department personnel to do their jobs, such as police vehicles, is inadequate. The Department lacks basic police management tools and processes that would allow its limited resources to be focused most effectively. As a result, the morale of the Department’s personnel is very low; the fact that they are still able and willing to provide services given the lack of support is commendable. Having the chief of police show that graph at a community meeting is refreshing enough, but even more remarkable is having the chief of police show that slide as he explains his goal that “by the Year 2015, Oakland is one of the safest large cities in California — both in reality and perception.” I have serious doubts about whether that’s an achievable objective, but I’m glad to have a chief of police who wants to try. There’s some of that in Chief Batts—when he speaks, you want to listen, and when he tells you that he can’t make Oakland into a better, safer city without your help, then you want to know where to sign up. I know I may sound like a schoolgirl with a crush here, and I don’t want to sound naive about whether he will actually be able to accomplish a lot in this mess of a city, but seeing Batts tonight reminded me of how rare it really is to encounter compelling leaders. Batts certainly has his work cut out for him, and only time will tell how much of an impact his strategies will have on public safety in Oakland, but sitting there listening to him, I was aware, as I’ve rarely been aware before, of the difference that strong, competent leadership can make. I’m curious to know how members of the OPD feel about him. My sense is that he is the kind of person that people want to work for: he preaches openness and transparency, he encourages discussion and new ideas, he clearly communicates his goals and his expectations for the department, he believes in encouraging practices that work and discarding practices that don’t work, he is a strong advocate of using empirical data to measure the department’s success, and perhaps most importantly, he has that ineffable quality that makes you want to help him succeed, and makes you believe that it might be possible. It’s been a terrible week for pedestrians around here. On Tuesday alone, a woman was killed in an Oakland crosswalk by a hit and run driver, a woman crossing the street in San Francisco was killed by a city utility truck (she appears to have been in a crosswalk too), and yet another woman was critically injured by an SF Muni bus as she walked across a crosswalk. Then yesterday, two teenagers were hit by an SUV in Santa Rosa as they walked across a crosswalk, and one of them is critically injured. I understand why these individual incidents don’t make big headlines. (The Oakland hit and run death was relegated to the “News Briefs” on page 6 of yesterday’s Oakland Tribune; homicides sometimes get the same treatment—when these tragedies become routine, then they no longer qualify as big news.) And I also understand, legally speaking, why drivers who hit pedestrians (or bicyclists) are rarely held responsible for their negligence—these are, after all, “just accidents,” as the police often say when they explain why no one is being charged in these cases. Despite what it may feel like when one is walking or biking around American cities these days, the overwhelming majority of automobile drivers do not actually want to hit anyone. And the fact that responsibility for all these pedestrian deaths and injuries is borne by a diffuse array of individual drivers, rather than a single entity like a car company or a terrorist group, makes it seem less like a systematic problem and more like a random set of unavoidable tragedies. It is a systematic problem, however. I don’t know precisely what perverse set of historical developments got us where we are today, but the fact is that we as a society have taken most of our public space and turned it over to millions of absent-minded or distracted or careless people who are each controlling about a ton of fast-moving metal. In my opinion, this is completely insane. It’s no wonder that so few people walk anywhere in most parts of the country! And not only have we turned over most of our urban public space to people in cars, but we then do a lousy job of ensuring that they drive responsibly. Any 16-year-old who can do a three point turn can get a license to kill—excuse me, I mean a license to drive. Drunk drivers, who are essentially broadcasting to the world the message that they do not really care if they take the life of another human being, are usually allowed to get behind the wheel a few months after getting a DUI—and we usually don’t even take their cars away, so these people who have already displayed a lack of concern for obeying the law and for other people’s safety can easily get behind the wheel and drive to their favorite bar again, suspended license be damned. It’s about time that politicians (aided by the police, prosecutors, etc.) undertook a serious effort to make people realize that recklessly endangering the lives of other people will not be tolerated anymore. Even baby steps would be a nice start, such as aggressively ticketing all the oblivious drivers who blithely cruise through intersections while people are in crosswalks, forcing the walkers to jump back to the curb—if the risk of killing pedestrians isn’t enough to make drivers pay attention, then maybe a few moving violations will start to do the trick. I was talking to a politically active friend about a month ago, as the Senate was about to pass their version of health care reform legislation, and I told him I was nervous that the Democrats in Congress, being Democrats in Congress, would find some way to fumble the ball one yard from the end zone. My friend tried to reassure me that the hard part was over, and now it was just a matter of hammering out some compromise between the Senate and House versions of the bill, and finalizing passage of the negotiated bill for President Obama to sign. Of course I had no inkling at the time about the cruel twist of fate that would cause such a fumble—the fact that it is Ted Kennedy’s Senate seat which is endangering the passage of any kind of health care reform is horrifying, given that the expansion of health care to the poor and uninsured was Kennedy’s life’s work. So what should be done now that the possibility of getting any compromise bill past another Republican filibuster attempt in the Senate is gone? I’m no expert in health care legislation, and I won’t pretend to understand the details of the legislation the Senate passed, but I trust people who do understand the details, like Jonathan Cohn of the New Republic, or Paul Krugman of the New York Times, or Dean Baker and Jacob Hacker and others who are urging Democrats in the House of Representatives to pass the Senate Bill as it is, so that it could go straight to President Obama for his signature without having to pass through the Senate gauntlet again. I wrote to Congresswoman Barbara Lee via her house.gov web page today (letter reprinted below), and called her office as well. The aide I spoke to on the phone told me that Lee had not made a decision on whether she would be willing to support the flawed Senate bill, but said that they were getting a lot of feedback from constituents. I told him that this seemed likely to be the only real opportunity to pass any kind of significant health care reform for the foreseeable future, and that I urge Lee to help make sure that Democrats in the House of Representatives do not miss this chance. I encourage other people to contact Congresswoman Lee (or whoever your representative is) and tell her staff that this is not the time to hold out for a better bill, or to shelve health care reform until some other year—if it was this difficult to get inadequate legislation through the Senate with a filibuster-proof supermajority, then “progressive” Democrats are crazy if they think that they will be able to get something better passed in the near future. Barbara Lee may not have to worry about her own re-election, but opposing the Senate bill because it is inadequate is not standing on principle—it is supporting the status quo. The phone number of Lee’s Washington office is (202) 225-2661, and her staff eagerly await your calls. I am concerned that if Congress does not enact the health care reforms currently on the table, then significant health care legislation with not be passed for years and probably decades. I know that the Senate bill is very imperfect, but the status quo is simply unacceptable: tens of millions of Americans have no insurance, resulting in unnecessary deaths, expensive emergency-room visits, and medical-related bankruptcies. This is a disaster! I am appalled that Democratic members of congress are on the verge of letting this unique opportunity to enact real reform pass by. Democratic majorities in the Senate and the House are unlikely to be this large in coming years, so the notion that it is better to wait and try to pass better legislation in coming months or years strikes me as wishful thinking. This may be the only chance to take a significant step in the right direction on health care reform, and if this opportunity passes, then Democrats in Congress will share responsibility for all the unnecessary deaths and bankruptcies that we see in the future. Please do not let the perfect be the enemy of the good. I urge you to do everything in your power to pass the Senate health care reform bill and get it on President Obama’s desk. Please let me know where you stand on this once-in-a-generation chance to finally do something about our awful current health care system. In a city which had to severely cut core services in order to deal with a 20% shortfall in its general fund earlier this year, and which faces further fiscal fiascoes for the foreseeable future, can someone explain to me why being the Chair of the City Council’s Finance Committee is being touted by Oakland mayoral candidate Jean Quan’s supporters as an argument in her favor, rather than an argument against her? Quan’s supporters cited her knowledge of Oakland city government as one of her main qualifications for mayor. She has served as chair of the City Council Finance Committee, which has had to make difficult decisions in cutting close to $100 million from the 2009 city budget, with a projected $25 million of budgets cuts still to come in 2010. 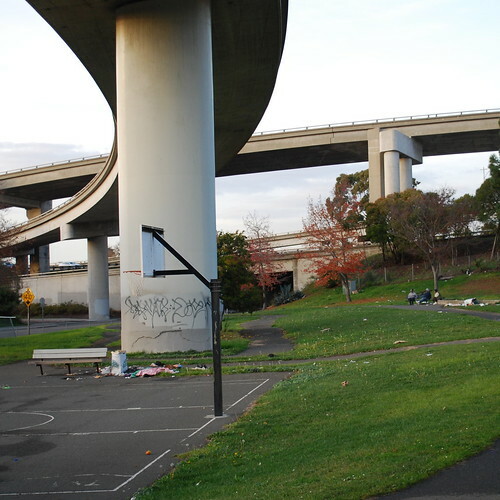 As consolation, perhaps, for the razing of hundreds of homes, the empty land under these interchanges was leased by CalTrans to the City of Oakland for use as city parks. And what lovely parks they are! I was reminded by a column in the Contra Costa Times today that construction of a fourth tunnel for Highway 24 under the Oakland Hills is scheduled to start next year. 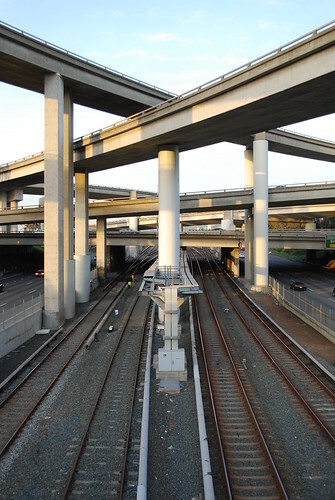 The BART Board of Directors also gave final approval to the redundant, ugly, expensive and slow Oakland Airport Connector last week, so construction on that will start next year too. 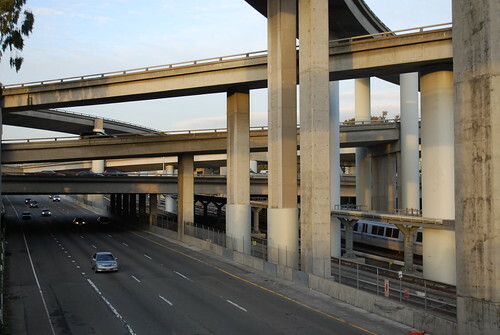 Both construction projects are scheduled to last through 2013, so for three years, Oakland will be bracketed by two large public works projects, one at our northern tip and one at our southern tip, both of which are intended to serve the needs of suburban commuters and travelers. 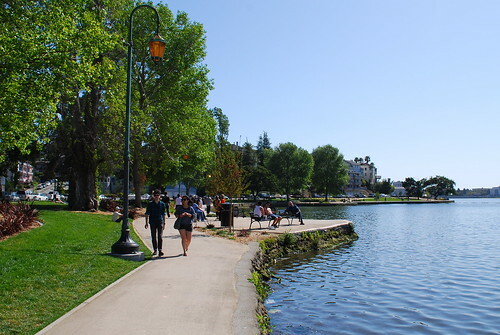 Meanwhile the city spread between the two projects will continue to suffer, as parks go unmaintained, bus service is reduced, library hours are shortened, and so on. The story is always the same: cater to suburbanites and drivers, screw the urban poor, and justify it by citing job creation. Job creation is used as a trump card in a city with a 17% unemployment rate, but you can also create jobs paving city streets or increasing bus service or building infill BART stations instead of expanding highways and building elevated cable cars to the airport. I’ve wondered in some of my earlier posts whether our new New Deal would leave a legacy of enlightened infrastructure like enhanced bike paths and more extensive mass transit infrastructure. 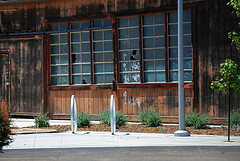 How naive those musings seem now: it should have been obvious that CalTrans and BART and the other relevant authorities would use much of their American Recovery and Reinvestment Act funds ($197.7 million in the case of the Highway 24 tunnel, $70 million in the case of BART’s airport connector) to fund long-planned projects that will either encourage car commuting (the fourth tunnel for Hwy 24) or duplicate an existing airport shuttle at the expense of local bus and rail service while creating additional overhead eyesores over the streets of Oakland (the airport connector). 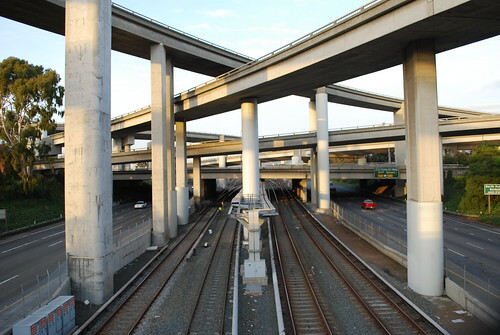 As it happens, both Highway 24 and the BART tracks leading from suburban Contra Costa County toward the Oakland airport are shown in the photos above. 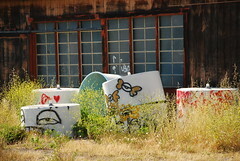 While those freeway drivers or BART riders speed from Walnut Creek to the airport under the 34th Street crossing, bypassing Oakland almost entirely, people will continue to be shot to death on that blighted stretch of Martin Luther King Jr. Boulevard, and few people will feel any need to take notice. Sure, Mr. McCain, whatever you say—this is why Republicans are trying to scare senior citizens into thinking that Democrats want to take their government-administered health insurance plan away, right? The fact is that people on Medicare are significantly more satisfied with their health care than people in private plans, and the VA system produces significantly better care for patients than private plans while managing to control costs impressively, in comparison to skyrocketing costs everywhere else. McCain’s comment is especially rich—which is to say, infuriating—because he has been the beneficiary of government-administered health plans for literally his entire life, first as the child of a naval officer, then as a naval officer himself (who tragically needed extensive medical care after the torture he received from his Vietnamese captors), then as a veteran, and then as a member of congress, and then as a person over 65. Of course, as the husband of an heiress, he can afford whatever health care he wants without any government involvement, but unless he has a plan for enabling the 46 million uninsured Americans to marry heirs and heiresses, it would be nice if he at least allowed them to buy into a government-administered health plan similar to the ones that he has relied upon throughout his life. Chutzpah is often defined as killing one’s parents, then suing for the inheritance, but if anyone is seeking an alternative definition, I can think of one. I know it’s not a shock to hear this sort of knee-jerk nonsense from politicians and pundits, but it’s especially galling when it comes from someone with McCain’s biography and health history. Whatever Barack Obama’s faults are, and whatever inadequacies the final health care bill will inevitably contain (assuming that a bill does get passed this year—knock on wood), just think about what the terms of the health care debate would have been if John McCain had been elected instead. Is Gavin Newsom the first gubernatorial candidate in history to livetweet the birth of his child?